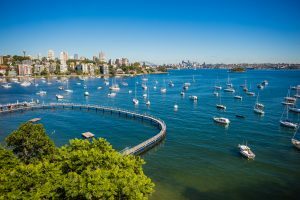 Sydney, Australia, March 16, 2016 /ChinaNewswire.com/ - The historic Sydney Harbour estate "Elaine" has just been relaunched as "Elaine Gardens," with approval for up to four homes on the iconic grounds. The development approval means that the estate is eligible for purchase by foreign non-residents. This will undoubtedly heighten its appeal with international buyers, aware that Australia’s Foreign Investment Review Board heavily regulates the sale of established homes to non-residents. In recognition of that, the entire campaign has been produced both in English and Chinese, to ensure constructive engagement with one of Australia’s most prominent offshore buyer markets. Under the proposal, buyers have the option of acquiring the entire estate, which sits over 1.7 acres on the Harbour front at prestigious Point Piper, and creating a one of a kind private compound. Alternatively they can purchase one or more of the individual home sites. With a price guide of $75million-$80million for the whole estate, a sale would set a new Australian price record. The nation’s current record stands at $70million, set in mid 2015 by the Vaucluse mansion of billionaire businessman James Packer. The agent who transacted that sale, Ken Jacobs of Christie’s International Real Estate, is heading the “Elaine Gardens” campaign. Under the "Elaine Gardens" vision, which was rubber stamped in December, approval has been granted for two new homes to be built each on half acre lots along the beachfront section of the estate, with price guides of $25million to $27.5million. There is also permission for an extensive rejuvenation plan for the existing “Elaine” homestead, which has a price guide of $13million to $14million as well as the neighbouring coachhouse, which has a price guide between $4million and $4.4million. "Elaine" is undoubtedly the most important residential real estate offering in Australian history. For more than 125 years it has been in the hands of one of the world’s great media dynasties, the Fairfax Family, and played host to royalty, world leaders, celebrities, and some of Australia’s most glittering events. When initially introduced to the global property, the campaign focused heavily on selling the estate as one lot — despite the fact it is set over six titles. But current day owner John B. Fairfax says, while the property has had not shortage of suitors, it became evident that in nearly all cases the potential for further change remains a core interest for buyers. The Fairfax family responded by undertaking its own development plan, ensuring a respectful outcome for their treasured estate while delivering certainty for buyers. Leading Sydney architect John Rose led the vision for Elaine Gardens, which includes plans for the two new residences carefully set into the grounds below the main homestead, looking directly onto the Harbour. Conceptual drawings show them to be sleek and modern homes that complement rather than compete with the existing historic buildings. Selling agent Ken Jacobs of Christie’s International Real Estate says the quality of the development plan and the certainty it now provides will put “Elaine Gardens” in a league of its own. “I genuinely believe there is no other home in Australia that can top this offering, because of the potential and flexibility,” said Mr Jacobs.